This recipe has been in my family as far back as I can remember. I was eating it in my grandmothers kitchen when I was young, my mom made it all my life growing up and I still make it at least once a month to this day. My grown son is now making it for his family as well. It's simple, it's cheap to make, and it's delicious. As a side note for those of you who know someone who doesn't like sauerkraut, trust me when I tell you, I have made this recipe for MANY who claim not to like it and they end up loving this casserole. Even if you yourself don't like it but someone in your family does, go ahead and give it a try. I promise, it just down right good eaten. Preheat oven to 350Â°F. Brown ground beef or turkey with chopped onion and season with garlic powder, salt and pepper until done. Prepare egg noodles according to package. Make sure you don't over cook them. You want them slightly al dente. Drain sour kraut and pour into the bottom of a greased 9x13 pan. (or you can use a casserole dish or roasting pan if you'd like) Sprinkle with brown sugar. Pour drained (but not rinsed) egg noodles over sour kraut and brown sugar. Pour hamburger or turkey over egg noodles. Mix 1 can of warm water with the 2 cans of tomato soup. Make sure you have all the lumps out of the soup and it is mixed well and smooth. Pour over hamburger or turkey evenly. Use a fork as you are pouring the soup along the sides of the pan to pull the mixture away from the edges to allow some of the soup to seep down the sides slightly. Bake at 350Â° for 30-45 min until cheese is brown and edges are bubbling. Let stand 5 minutes before serving. 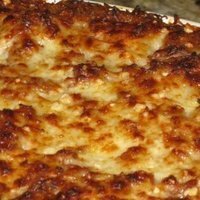 Don't forget the garlic bread and/or a nice lettuce salad to accompany this great casserole. Enjoy!